Kim was my first real girlfriend, and by â€œreal girlfriend,â€ I mean we made out in the front seat of my 1967 green Rambler, a car we called the Rolling Rock. Like me, Kim had type-1 diabetes. In fact, thatâ€™s what brought us together, besides the fact that she was really cute, and I had a car. When we first met nearly 35 years ago, we were somewhat normal teenagers, except we carried syringes, went to the bathroom constantly, and sometimes exhibited erratic behavior. Kim thought it was funny that I carried sugar cubes in my pocket. The correct remedy, according to her,Â was hard candy. I liked having Kim around me. 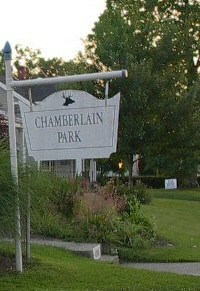 Most of the time, we hung out at Chamberlain Park, tossing Frisbee, swinging on the swings, kissing under the picnic shelter or on the park bench by the old cannon. We were teenageÂ sweethearts. IÂ thought it was cool that we had this condition in common. We understood each other. She laughedÂ when I asked her in public if she was high … the first seventeenÂ times. After the first day or two of our romance, however, we almost forgot about the diabetes connection. It became a teenage love connection. We walked hand in hand in the rain, drove around in my car, sat in the park late at night staring at the stars, and kissedâ€”we kissed a lot. She cheered for me as I played baseball. We sat on the steps of her front porch across from the firehouse and I listened to her stories about her family. There was our song: â€œIâ€™m in You,â€ by Peter Frampton. Weâ€™d talk on the phone for hours about nothing. Diabetes was the furthest thing from our minds. But I was glad it brought us together â€¦ for those three glorious weeks. Then Greg came along and took Kim away. I saw them at the park one day, walking along the railroad tracks together. That was it. Yes, people with broken pancreases have some unique highs and lows in life, but mostly we experience life like everyone else does, including romance and broken hearts. People come and go in our lives and many of them make an impact on us. Chamberlain Park still holds special memories, and to this day, I prefer hard candy to sugar cubes. Not only touching, pertinent to we T1ers, but very well written. Well done Mike! Curses to Greg! But seriously, what a great story. Thank you for sharing!